FILE PHOTO: An employee shows fifty-euro notes in a bank in Sarajevo, March 19, 2012. TOKYO - The euro slipped on Monday after German Chancellor Angela Merkel won a fourth term in a weekend election, but faced leading a much less stable coalition in a fractured parliament as support for the far-right party surged. “The market reacted by selling the euro on the possibility of Merkel running into difficulties in forging a coalition. 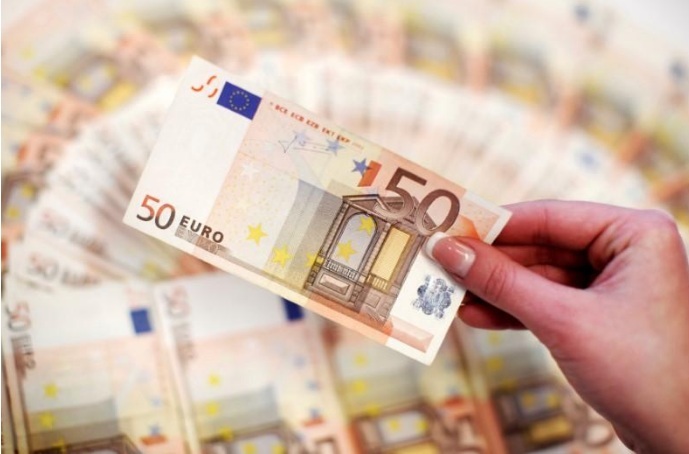 The euro, however, was already losing support from the European Central Bank’s monetary policy theme and appeared to be on its way lower,” said Daisuke Karakama, chief market economist at Mizuho Bank in Tokyo. The euro was down 0.2 percent at $1.1934, putting more distance between a 2-1/2-year high of $1.2092 reached on Sept. 8, when a European Central Bank policy meeting left currency bulls optimistic the ECB would begin tapering its big stimulus program. The New Zealand dollar suffered a similar setback, falling as New Zealand’s ruling National Party won the largest number votes in Saturday’s election but without a ruling majority and now faces a round of coalition building that could last days or weeks. The New Zealand dollar, the world 11th most-traded currency, was down 0.7 percent at $0.7288. MSCI’s broadest index of Asia-Pacific shares outside Japan .MIAPJ0000PUS was 0.2 percent higher. Japan's Nikkei rose 0.6 percent, Australian shares climbed 0.4 percent and South Korea's KOSPI was flat. The S&P 500 and Nasdaq closed slightly higher on Friday as worries about the Graham-Cassidy proposal to reform U.S. health insurance eased and investors shrugged off concerns about North Korea. The pound was on the defensive after British Prime Minister Theresa May failed to give any concrete details for how Britain might retain preferential access to Europe’s single market after Brexit. Sterling was little changed at $1.3506 after losing 0.6 percent on Friday. Its peers’ troubles lifted the dollar, with its index against a basket of six major currencies up 0.1 percent at 92.274 .DXY. The greenback was up 0.4 percent at 112.455 yen, reversing losses suffered on Friday when the exchange of insults between U.S. President Donald Trump and North Korea heated up, sapping broader risk appetite. Brent crude futures LCOc1 was up 0.05 percent at $56.88 a barrel, not far from a 6-1/2-month high of $56.91 set on Friday.